The Bible claims to be the Word of God and to be sufficient for understanding the world in which we live. But how do we know it can be trusted? Why 66 books? Is the Bible enough? Are there contradictions? Where is the proof of creation? This Pocket Guide to The Bible by Answers in Genesis will give you answers to these questions and more. The Bible contains the very words of God and is the key to understanding the world in which we live. It is the history book of the universe, and the instruction manual for mankind. 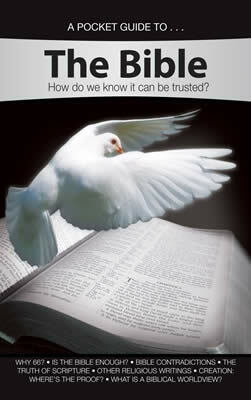 The Bible was written by the Creator, so we can put our trust in it! Tagged Answers in Genesis, Book, Ken Ham.